Sometimes it's really striking how random co-incidences of news items surface on one's screen simultaneously. As geographers and planners, we’re actually well aware of the unholy alliance of land and money, of property and profit, which is the subject matter of this blog entry. A huge body of literatures, both from theory and practice, reveals the prominence and ever-shifting nature of this relationship. Its significance for cities, people and urban life has increased dramatically in recent times, based on a weird assemblage of capital flows, speculative attitudes, and both absence and presence of governance. 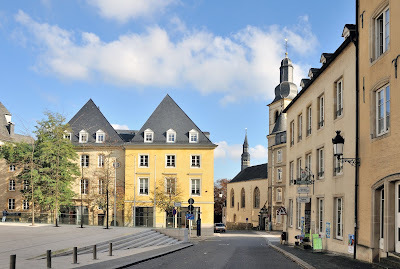 (1) Last week, such things came together quite nicely in the case of our capital, Luxembourg City, which is a small (roughly 117,000 inhabitants) but powerful economic centre, as the following four short vignettes may illustrate. First, as to the more generic if not theoretical background of this issue, Robin & Brill explain why urban development that is grounded in private real estate particularly succeeds in times of financialisation, and how, in turn, the latter has increased the pressure on urban processes. (2) (Thank you, Tom Becker, for the hint!) Real-estate players are not only extracting value from transforming and trading urban property, but have become important “transfer agents in the global flow of urban models”. (3) Besides accelerating unaffordability in cities, this phenomenon helps mobilize different conceptions of what the city should be about, blueprints of which can then be found on display at real-estate fairs such as MIPIM, in Cannes, or EXPO-REAL, in Munich. This peculiar politics of land and territory is sometimes difficult to detect, as it is often hidden under the surface of the smart, competitive or sustainable city. Only accidentally do such issues become apparent and garner public attention. This leads us to the second case in this context, which was raised by the on-line magazine www.reporter.lu, in Luxembourg, at the end of May. (4) One of the cover stories addressed the high-end property prices in the city’s "Oberstadt" – indeed, it is called ‘upper city’ (5) – a small area that was once the trading centre and political hotspot for the capital city and country. In its central parts, it now represents an assemblage of three different types of land uses: i) it is an overly polished retail space, with an increasing number of luxury chains; ii) it is composed of various commodified spaces with ascribed historical and heritage significance, attracting tourist flows (e.g. Place Guillaume II, Place d’Armes, the Casemates, the Notre-Dame Cathedral, etc. ); and iii) it is a space of political power embodied by the Grand Duke’s urban palace, the National Chamber, and the Town Hall. Roughly 3,500 people live there on a territory of about 105 hectares – that is, the Oberstadt houses only 3% of the city’s overall population on little more than 2% of its territory. So far, the Oberstadt retains significant symbolic value and is considered to be high, just as the business opportunities offered for bars, restaurants and selected retail outlets are. rue Sigefroi 2008 (Source: Cayambe, CC-BY-SA 3.0). 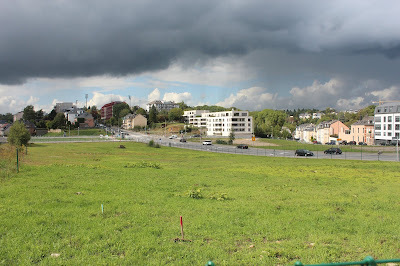 Third, another key site in Luxembourg City where the alliance of land and money is breeding profit, undisturbed - or even mastered - by politics and planning, is the yet brownfield “Place de l’Etoile” (Star Place) (figure 2). It is situated west of the city centre, where sub-urban and cross-border commuter flows meet the office enclaves of the Boulevard Royal and adjacent neighbourhoods, including the Limpertsberg area that was hit hard by the reconversion of flats to offices. On the 26th of May, media coverage revealed that Etoile won’t be hosting another mixed-use space of shopping, offices and apartments, as it was planned until now. (7) Instead, it is now destined to provide a massive injection of hundreds of luxury apartments. The key player in this respect is ADIA, the Abu Dhabi Investment Authority, a sovereign wealth fund that is owned by the Emirate of Abu Dhabi (United Arab Emirates). ADIA has been active in Luxembourg for some time now. It is, for example, part of the first mixed-use flagship project Hamilius that is currently under construction in the central city (see former blog posts here, here and here). ADIA had bought the approximately two-hectare piece of land at Place de l’Etoile, in 2016, for a reported amount of 150 million Euros. 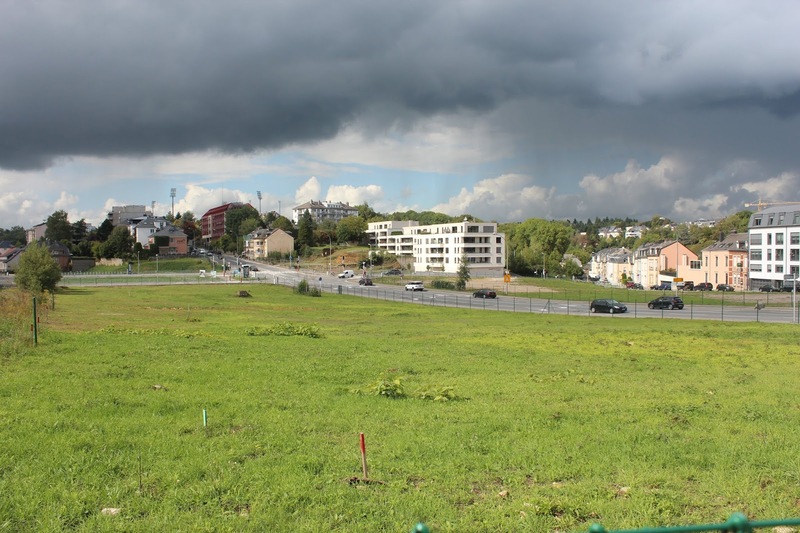 According to Jones Lang LaSalle, it was, “one of the largest land transactions ever made in Luxembourg”. ADIA not only provided the investment, but it will keep the apartments in its own portfolio and bring them on the market for rent. This is obviously more lucrative than renting out office space would be – and it is clear indication that the housing market will further rocket to a dimension that is entirely unaffordable for the average renter or buyer. The story behind the potentially new prospect for Etoile (official confirmation is still pending) is as delicate as many other land deals in the city are. Etoile is understood to be the terrain that was kept vacant the longest in the capital city, and speculation was probably the most important reason for this. However, the art of properly phasing investments and getting them nested in the local realm is always accompanied by complex processes of political decision-making and urban planning. In the case of Etoile, it seems a strange mix has made it possible: a mix of both governance presence and absence, the active channeling of money flows through the complexities of rules and regulations, and the deliberate abdication of any substantial claims about affordability, social issues, urban design qualities and the like. Fourth and finally, we can situate these observations in the context of comparisons on a broader scale. In light of the above, it is absolutely no surprise that Luxembourg City popped up in the 2018 edition of the Swiss UBS-report on Prices and Earnings in 77 top metropolises of the world, which was also published last week. (8) It ranks 3rd, 5th and 15th in terms of earnings, purchasing power, and price level, respectively. Cities of comparison are all major economic centres of the world, most capital cities of both leading and emerging economies, and also second-tier cities such as Frankfurt, Germany; Geneva and Zurich, Switzerland; or Lyon, France. The cities surveyed were labeled by the authors as ‘global cities’. Luxembourg City, probably the smallest of all the sample cases, is slightly cheaper than Paris, more expensive than cities such as Seoul, Dublin, or Brussels, but at the same time, one of the very richest. (9) The mismatch between size and function or power looks impressive, but it is also associated with an increasing amount of conflict and tension. While the setting is increasingly global and prices are rising, the middle-and lower classes are running into problems – most notably in terms of housing, for which even the higher average earnings no longer suffice. Thus, there are certain costs associated with grooming a small city as a hotspot in world’s economy. Yet, for various reasons, the capability to respond to these problems seems limited. Money (both as a resource and as a source of greed) is only one but rather powerful limiting factor here; others are simply successful lobbying, overall ideologies, or institutional inertia. This is seldom so clear as it was last week, when different news agencies reported on the peculiar links between land and profit. Watch out for Part II of this entry that will follow next week, briefly discussing: what the lessons learned from these cases are, and what the takeaway could be in more general terms; for properly interpreting what financialisation means for urban development and policy; and, for estimating the ramifications for practice, such as policy and planning. 1) Just to name a few and recent sources: Halbert, L./Attuyer, K. (2016). "Introduction: The financialisation of urban production: Conditions, mediations and transformations." Urban Studies 53(7), 1347–1361; Madden, D./Marcuse, P. (2016). In Defense of Housing. The Politics of Crisis. London/Brooklyn: Verso; van Loon, J. & Aalbers, M. B. (2017). "How real estate became ‘just another asset class’: The financialization of the investment strategies of Dutch institutional investors." European Planning Studies 25(2), 221-240. 7) Trapp, W. (2018) Ausverkauf der Stadt? „déi lenk“ wehrt sich gegen neue Pläne. Tageblatt 121, 26./27.5.2018, p. 48. 9) This global position of a small money enclave and political capital is also subject of our GLOBAL research project, which will reveal its first findings soon. Related conference appearances are foreseen this Summer for GCEG, Cologne, IGU Urban, Montréal, and RGS/IBG, Cardiff.